Are you wondering if you can make your retirement savings last? Concerned about inflation reducing your purchasing power? Worried about the stock market's violent swings? 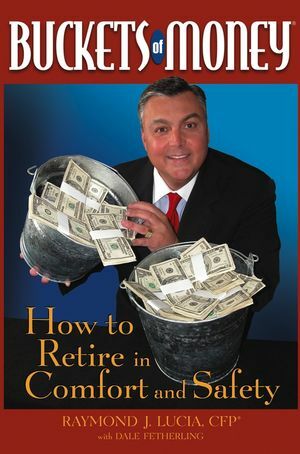 In Buckets of Money: How to Retire in Comfort and Safety, nationally recognized Certified Financial PlannerTM and radio personality Ray Lucia offers you a smart and conservative way to protect and grow your nest egg-so you can enjoy a comfortable retirement without worrying about your money running out. Developed by Lucia over his thirty-year career as a financial planner, the "Buckets of Money" technique is a proven way to achieve both income and growth, while guarding against the ravages of inflation. Buckets of Money is filled with in-depth insights and practical advice that will help you assess your retirement situation, save the money you need to last your entire lifetime, and adjust your plan to good times and bad. Regardless of your age, income, net worth, or investment experience, you need to have a solid plan for your retirement years. Buckets of Money provides you with such a plan, and shows you the best way to implement it. RAYMOND J. LUCIA, CFP®, is a nationally renowned expert in the field of financial and business management. He is the President and founder of Raymond J. Lucia Companies, Inc., which manages over $500 million in assets. Ray’s radio show, The Ray Lucia Show, is heard in over sixty markets across the country. He has been called "A rising star in talk radio," and listed as one of the top 100 most important radio talk show hosts in America by Talkers magazine. Part I: Introducing the Buckets. Chapter 1: Everybody’s Got an Investment Idea—But Is It a Good Idea? Chapter 2: Why Your Grandmother Was Right After All! Part II: Understanding the Buckets. Chapter 3: What Kind of Investor Are You? Chapter 4: Buckets: The Simple, Yet Proven, System. Part III: Filling the Buckets. Chapter 5: The First Bucket: Consistent, Sometimes Guaranteed, and Potentially Tax-Favored Income. Chapter 6: The Second Bucket: A Conservative Cache for Inflation-Indexed Income Later. Chapter 7: The Third Bucket: Investing for Long-Term Growth. Chapter 8: Getting Your Buckets All Lined Up. Chapter 9: Managing Your Buckets in Good Times and Bad. Chapter 10: Repairing the ‘Hole’s in Your Bucket. Chapter 11: Bucketizing My Life. Part V: Living Happily Ever After As a Bucketeer. Chapter 12: Finding the Right Financial Planner. Chapter 13: 10 More Steps You Could Take to Help Bulletproof Your Retirement. Chapter 14: Enjoying Life As a Bucketeer. Appendix B: Helpful Online Sites.